The post-mortem conducted on the body of millionaire businessman Mohammed Sulaiman, 29, of Kotelawala Avenue, Bambalapitiya yesterday revealed that he died after being struck on his head, above the left ear, within an hour of abduction. Chief Judicial Medical Officer of Kegalle Hospital Ramesh Alagiyawanna in his report said Sulaiman’s death was caused by a blow with a blunt weapon on his head. Police investigators now suspect that the businessman had been killed, when the ransom demand was made by the abductors. Mawanella Police said the body was in a decomposed state, when it was recovered by police on Thursday night. The businessman's body was recovered a few hours after the Colombo Crime Division sought public assistance to trace his whereabouts. Eight police teams specially trained in crime detection and sniffer dogs were deployed to investigate the murder. Meanwhile, at the magisterial inquiry held by Mawanella Magistrate Mahinda Liyanagama yesterday, the body was identified by Mohamed Iqbal Sahab as that of his nephew Sulaiman who was abducted from his Bambalapitiya residence. He identified the shorts, pair of socks and the blue denim trouser worn by Sulaiman. The Magistrate who examined the body ordered Police to note down the cuts and bruises on the body and send the body for a post mortem examination to the Kegalle JMO for a report to be submitted to him. Burial took place at the Maligawatte Muslim burial grounds yesterday. “Sulaiman was abducted on August 21 night near his house at Kotelawala Avenue, Bambalapitiya. 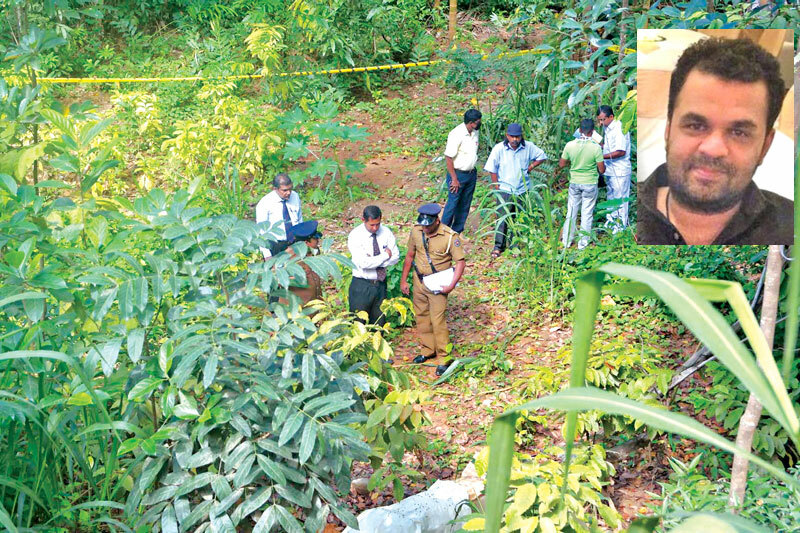 Investigations revealed that he had been murdered at the same place and the body taken to Hemmatagama, Mawanella and dumped at Demaddewatte near Rukulagama road by the killers before they escaped,” IGP Pujith Jayasundera said. The IGP said several police teams have been deployed to arrest a relative of Sulaiman on suspicion regarding the murder. He said this relative had disappeared after obtaining over Rs. 40 million from the late businessman. Sulaiman had lodged a complaint against this relative to the CID. The IGP said the CID, Colombo Crimes Division and several Police teams are conducting investigations into this murder and they hoped to arrest all suspects within the next few days. Police said the abductors had taken the businessman's body and dumped it at Hemmatagama to divert investigations to a different direction. The body was in a state of decomposition when it was found. It had been first seen by a labourer who was cutting branches of trees. The labourer after seeing the body had informed a resident in the vicinity named R.W. Rajapaksa who in turn alerted Police on the hotline and informed the Grama Niladhari of Rukulagama. Police had submitted a report to the IGP after which officers of the Colombo Crime Division arrived with the relatives of the deceased who identified the body. Police are also questioning several persons who owed large sums to the businessman. Further investigations are continuing under the direction of DIG Nandana Munasinghe, DIG Lalith Pathinayake and Crime Division Director Nishantha Soysa under the supervision of IGP Jayasundera. Colombo Additional Magistrate Nishantha Peiris yesterday issued an order directing the Controller of Immigration and Emigration to prevent five individuals suspected of being involved in the murder of a millionaire businessman Mohammed Sulaiman of Bambalapitiya, from leaving the country. Filing a B report regarding the incident, the Colombo Crime Division (CCD) sought an order to prevent five individuals, Mohammed Imran Mohammed Ikbal, Mohammed Sadeer Basir, Mohammed Ikbal, M. Sumar and Mohammed Sally Mohammed Smith who were residents of Dematagoda and Bambalapitiya from traveling abroad on the grounds that there is a possibility of fleeing the country. Mohammed Sulaiman, 29, a resident of Kothalawala Avenue, Bambalapitiya was allegedly kidnapped in Kotelawala Mawatha, Bambalapitiya on the night of August 21 and police recovered his body from Rukulegama in Mawanella on August 24. The Court further ordered the police the that the blood samples suspected to be belonging to the deceased collected few meters away from his residence be sent to the GENETECH for a DNA report to ascertain whether the found sample was of Mohammed Suleiman nor not. In order to perform this DNA test, the GENETECH was directed to obtain a blood sample from the father of deceased. Meanwhile, the Additional Magistrate permitted the Police to peruse telephone conversation details in respect of four individuals.